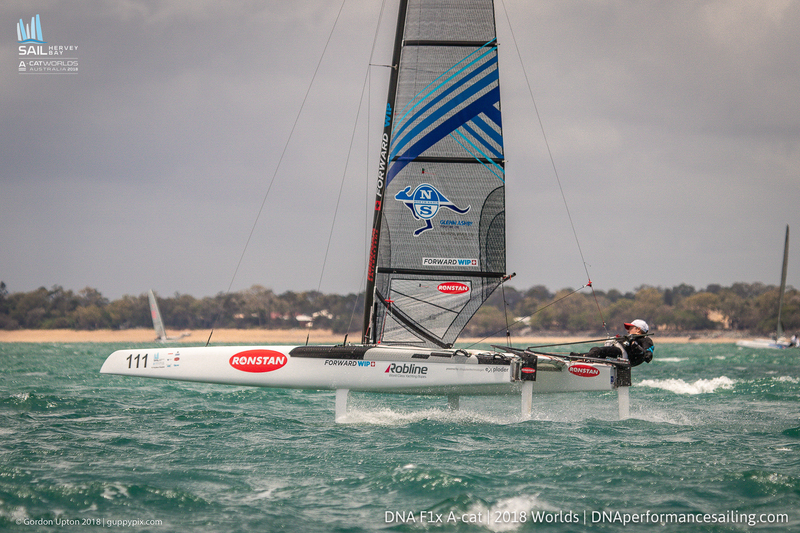 Home / First days racing at the Worlds abandoned after wind exceeded class limits. 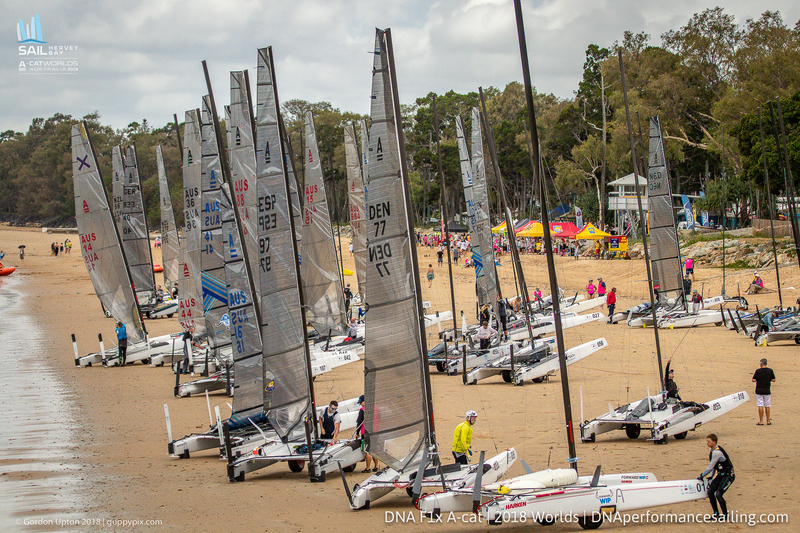 First days racing at the Worlds abandoned after wind exceeded class limits. In the famous words of the British journalist Brian Hanrahan, aboard HMS Hermes ‘I counted them out, and I counted them all back’. This is how it felt on the first dramatic day of the ‘A’ Cat Worlds. Following the 9am briefing, racing on day one was scheduled for 12:00. However, the forecast was for a building Sou’easterly offshore wind but from the shore, it all looked lovely. 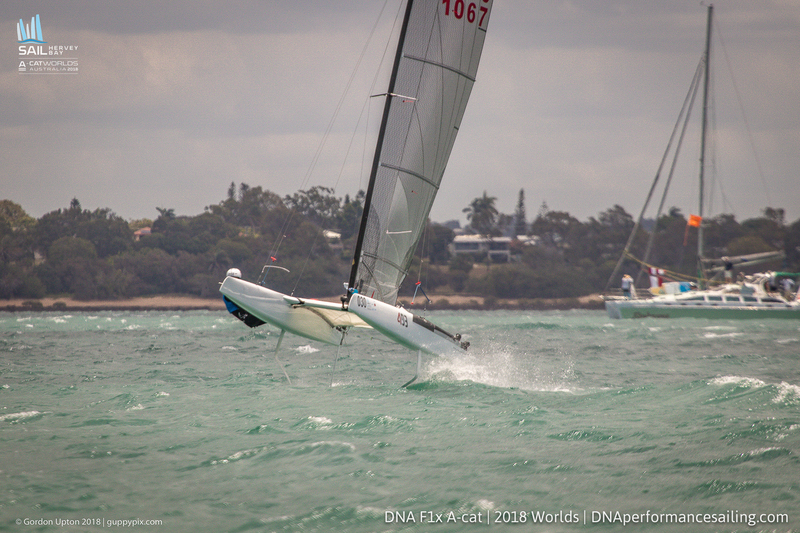 The Race Committee had finally decided to race on two courses, one for Classics and one for the Open or Foiling division. 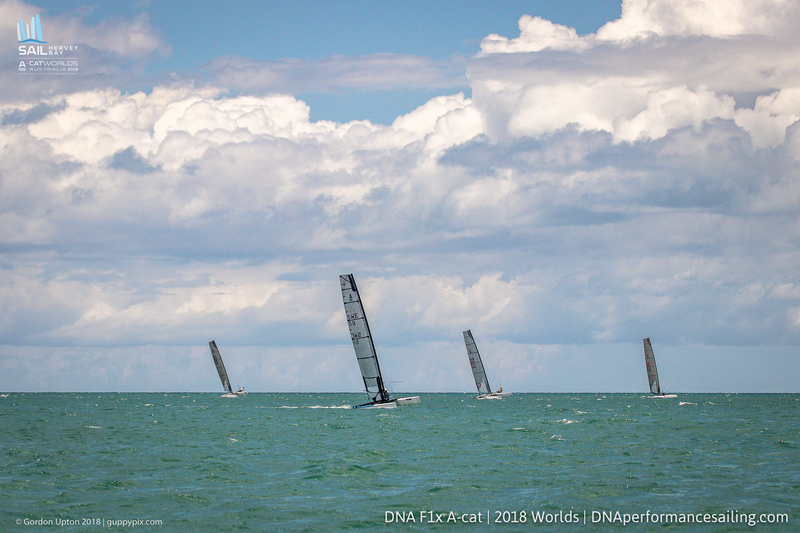 Initially it was thought that the two series would be held using the same course, with the Foilers two races being followed by the two Classic ones. But in the end, two sets of race officers, mark layers and officials headed out to their designated areas. Upon arrival, many competitors set about doing their final checks and testing their different settings for up and downhill. Then as the ‘On Station’ flag was finally hoisted, most came to heel like obedient sheepdogs. At this point the breeze was clearly not dropping. The Open course, being the nearer one to the beach launch area, got 2 minutes from the start sequence, when the 14 kt wind suddenly jumped to 26kts. 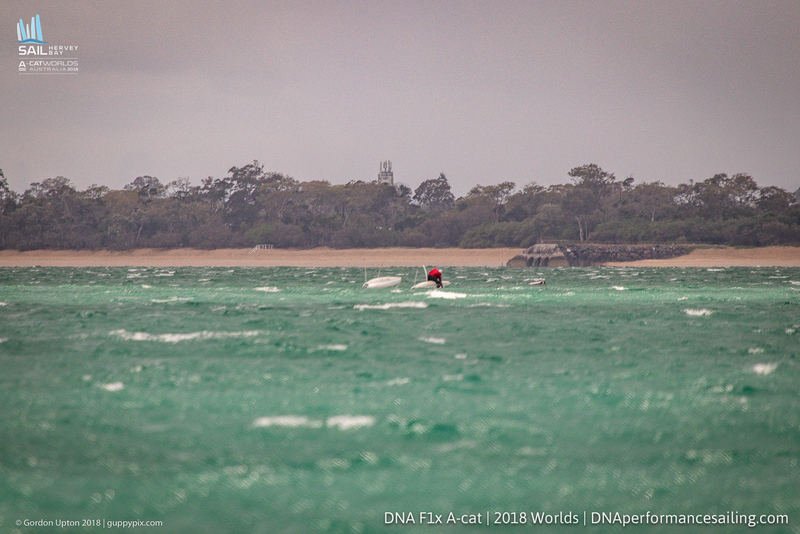 The official media boat was by now in the middle of the course, as a dismasted and inverted Classic had been spotted and it was thought wise to go and sit on station beside this new course hazard as a warning. Over on the Classics, they hadn’t even hoisted the ‘On Station’ flag before it hit. The race officers wisely wasted no time in hoisting the AP over H flag, sending them all blasting off upwind for the beach again. If windy mode hadn’t already been selected, it should be. This was by now, full on survival mode. From our position, now in course centre, and thinking we had missed a few radio calls, thought the race was underway. It was only as we first witnessed Peter Burling blast past, far ahead of the others, that we realized the ‘Go Home Fast’ order had been given. Boats continued to stream past, many with grim looks on their faces, as they battled back. But a few, Andrew Landenberger being one, just looked supremely in control and exuding an ‘all in a day’s work’ air. In the end, no one was hurt although Piet Saarburg lost his starboard bow in a collision, together with his mast, and that inverted boat had broken his mast after his rather agressive pitchpole. The Worlds have started with a bang, although it was a blank round in the end. Tomorrow, three races are scheduled and an earlier start time is proposed.